I hope you have all had a very productive week . 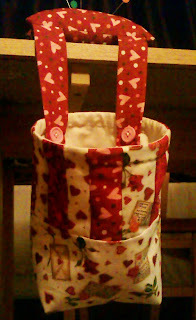 I have been a busy bee this week I have had 2 swaps to wrap and post out and I wanted to make a Pincushion Scrap Bag to take with me when I go to class. Here it is my scrap bag designed by my own fair hand. I have real problems following patterns . It isn't that I can't, it's that I'm a bit of a freestyler. So if I can design what I want myself I will. My swap items should arrive at their destinations soon so I will be able to post the photos then. I am also looking forward to receiving mine. I have two of these and I love them. The details on yours are awesome, though. I love the piecing and especially the buttons. Great job! That's a really fab scrap bag - well done!